To the south of Minneapolis, engagement photographers and their couples can create some stunning compositions in one of the area’s most popular parks. The gorgeous Minnehaha Historic District has been drawing visitors for well over a century. With its natural beauty and deep historic roots, the area is an ideal setting for a photo shoot. Begin your Minneapolis engagement photography shoot at the park’s most famous attraction, Minnehaha Falls. This is the same Minnehaha Falls that is immortalized in Longfellow’s “Song of Hiawatha.” The spot is popular for weddings because of its raw splendor. Minnehaha Falls Park affords innumerable spectacular views, from standing on the bridge atop and looking down to the valley below, to standing on a south side landing overlooking the rushing waters. Walk all around the falls to find beautiful shots, taking time to pose in front of the falls, the trees, the valley, and along Minnehaha Creek. To add vintage flavor to your Minneapolis engagement photography, head to one of the restored historic buildings within the park. Not far from the falls sits the well-preserved Victorian-styled Minnehaha Depot, a colorful former train station. The ornate station is a little bit traditional and a little bit Gingerbread House, which makes for an excellent backdrop for your engagement photos. Stop by a thrift store before you arrive to pick up some vintage threads and you can have your photographer create a really uniquely historic photo shoot. You and your beau can pretend to be waiting for your train beneath the awnings, or strike a pose in front of the quaint depot. 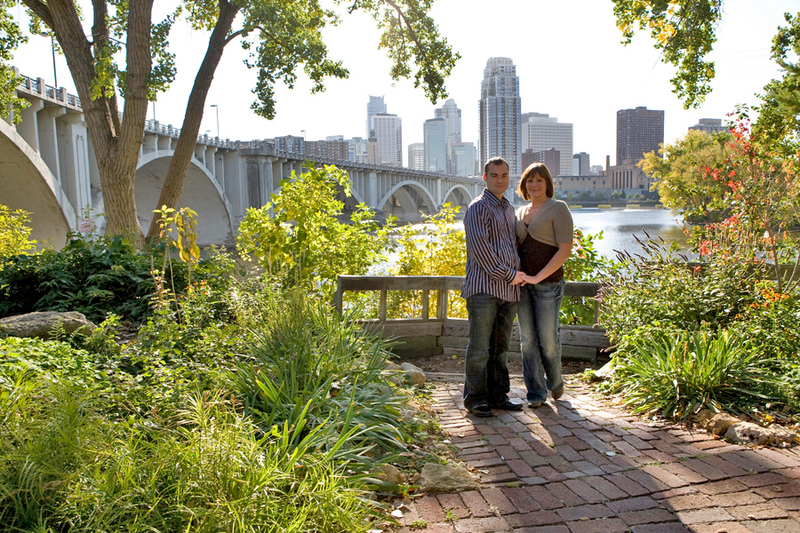 Complete your Minneapolis engagement photography shoot in one of the area’s tree-filled green expanses. Lie in the grass together or simply walk hand-in-hand between the towering trees. It’s not hard to imagine why Longfellow felt the need to immortalize this lush scenery, and you will be happy that you can have more than just poetic words in your album to recall its wonders. Minneapolis is the seat of Minnesota government, and as such, it is also home to some stunning pieces of stately architecture in the form of government buildings. To give your Minneapolis engagement photography session a hint of old-world architecture and elegance, head out to a couple of the city’s grandest buildings. Start off at the Minneapolis City Hall building. Built in the early 20th century, the building’s Richardsonian Romanesque style architecture makes it a fabulous backdrop for dramatic images of you and your future spouse. Pose in the courtyard in front of the imposing granite façade with the clock tower rising high above you both, then try leaning against the gracefully arched entryways for some casually posed pictures. To complete the shoot, take a ride over to neighboring St. Paul to get some shots at the Minnesota State Capitol building, where the state government takes action. The classically styled dome is one of the largest unsupported domes in the world, second only to Saint Peter’s Basilica in Rome. Have your photographer capture shots of you and your fiancé in front of the pristine white building or in one of the landscaped green areas surrounding the building. Your photographer can shoot pictures of the two of you sitting on the grand staircase, then head up to the top of the stairs for a surprise view. Since the building sits high up on a hill, the top of the steps affords a picturesque look over downtown St. Paul. Pose with your honey in front of the overlook to get some final shots for your Minneapolis engagement photography album. Your Minneapolis engagement photography session is a reflection of your couple style, so inject your shoot with some unique character. Wine connoisseurs can let loose, have fun, and get a bit tipsy as you and your honey make your way through a variety of Minneapolis vineyards on a chauffeured wine tour. A limousine will lead you around the Mississippi River Valley and St. Croix River Valley where some of Minnesota’s finest wines are cultivated. Treat your palate with everything from award-winning dry table wines to intense Frontenac wines. The vineyards in the area are as unique as you and your beau. Your Minneapolis engagement photography shoot can start off in the limo, with some classic kiss shots. At each vineyard, take time to explore the land and get some pictures with the grape vines that lace along perfectly, row after row tumbling gently into stunning green valleys. Your engagement photographer can also get some chic shots of you and your fiancé sipping the wines and contemplating their complexities. Sip from each other’s glasses and make the afternoon into a romantic date—one that just happens to have its own photographer. Your engagement photo album will quickly fill up with interesting snapshots and gorgeous posed pictures that will help you remember why you are perfect for each other.